At Holiday Inn Express Danbury, our number one priority is You, our guest. 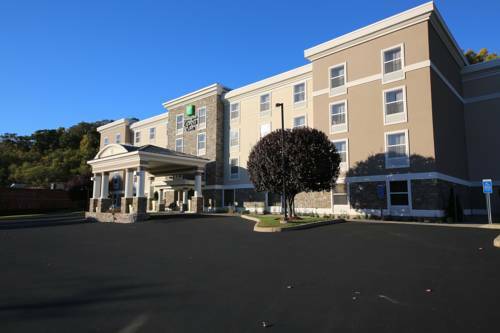 Comfortable and convenient, the Holiday Inn Express in Danbury is a perfect location when visiting for business or pleasure. Our Danbury hotel is an excellent option for business travelers, as it is centrally located near the corporate offices of Boehringer Ingelheim, Praxair, Hologic, Belimo, Cartus and Matrix Corporate Center. Conveniently located on the New York border just off I 84, we also serve Dunmore, IBM and Pepsi. Our number one priority is you, the guest. Whether you're in Connecticut briefly on business or here for a more extended stay you'll find only exceptional hospitality at Holiday Inn Express. During your stay you'll find complimentary wireless high speed internet access and use of eHost online concierge to access hotel and local area information. In each guest room enjoy standard luxury touches like massage shower heads, microwave, mini fridge, ergonomic desk chairs, soothing sound alarm clocks, gourmet coffee makers and 32 inch HD LCD TVs with satellite. You can start each day with our complimentary breakfast bar that features hot items including bacon, eggs and the signature cinnamon rolls. In a hurry? Grab a snack from our Guest Market without having to go grocery shopping. You can also enjoy our fitness center and an outdoor seasonal pool. Business services and meeting space are available. Water can come into play on this scenic layout on 14 out of 18 holes. The greens are a Bent/Poa mix and are well guarded by one of the 49 newly renovated bunkers surrounding the course. The undulating fairways are a mix of Blue/Rye.